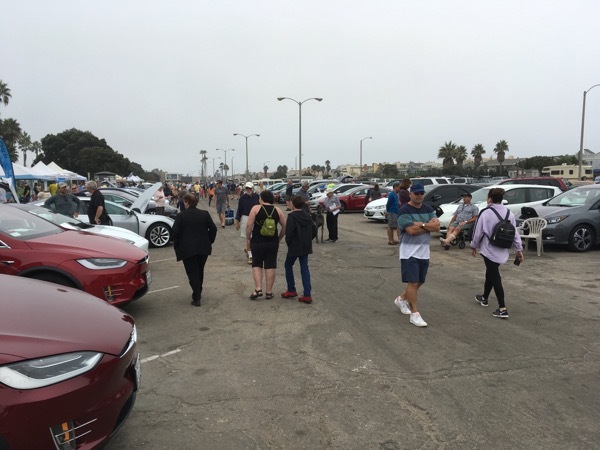 For the third consecutive year the National Drive Electric Week event in Oxnard was held at the Channel Islands Harbor on a beautiful Sunday morning. The EV Showcase and Ride and Drive were held adjacent to a renowned Farmers Market resulting in lots of cross traffic. Over 1600 interested people came to the EV Event and learned about electric vehicle use and adoption from 61 EV private owners and 6 EV-knowledgeable dealers who brought 28 vehicles. Besides viewing the countless static displays, 147 interested members of the public learned first-hand about EV use by taking test rides or drives. The EVs and PHEVs available for the test drive included the Tesla Model 3, the new Nissan Leaf, both a Chevrolet Bolt and Volt and the Chrysler Pacifica PHEV minivan. Also available for test drives were electric bicycles and NEVs. In addition, there was a 22’ Duffy Electric Boat on display. A regional pizza restaurant chain, Pizza Man Dan's, displayed its Spira4U electric delivery vehicles which it uses to deliver pizza to its customers. Later owner Dan delivered pizzas for our volunteers working our event in the Spira4U. EV-focused groups set up informational booths including The California Clean Vehicle Rebate Project, Plug In America, Los Padres Chapter Sierra Club and EV Advocates of Ventura County. Over 1600 people came to learn about plug-in vehicles. Here is a photo of some of the guests viewing the 89 different all-electric or plug-in hybrid models that were on display or available for test rides and drives at our event venue in the beautiful Channel Islands Harbor area of Oxnard, California In addition to the multiple private owners and EV-knowledgeable dealers, guests could get more details from several informational booths such as information about cash rebate and incentive programs. Sunday, September 9th 2018, 9:30am to 3:00pm at the Channel Islands Harbor. 3610 South Harbor Blvd, West Channel Park, between Cabezone Circle and Barracuda Way, just south of the Farmers Market. If you are interested in electric vehicles and would like to learn more about them, plan to visit and check out the variety of electric vehicles (EVs) that will be on display. Talk to EV owners and learn from their experience. Take a drive in several different models and makes of electric vehicles. Register to attend the event (click the blue register button at the top of this page, complete a short survey, and you'll be entered for a chance to win $250). If you are an EV owner - register and bring your car to the event (click the blue register button at the top of this page, complete a short survey, and you'll be entered to win a chance at $250). Share your real life experience about driving an EV with others in your community and network with your fellow EV drivers. This is an opportunity for us to come together to make connections and influence change. Vehicles on display by their owners will be current models and included among them are some vintage cars, neighborhood vehicles, bikes, cars right off the assembly line and even watercraft. Local Dealers will be on hand to display current models of electric vehicles and even provide you with the opportunity to get behind the wheel on a test drive. This is a great way to get the feel of driving an electric vehicle. If you want to participate in the ride and drive you must bring your valid drivers license and be over 18 years of age. At this time for test drives we will have the Nissan LEAF, Chevrolet Bolt and Volt, Chrysler Pacifica, Tesla Model 3 and X, neighborhood vehicles and electric bikes. National Drive Electric Week is presented by Plug In America, the Sierra Club and the Electric Auto Association. Local sponsors include the Los Padres Chapter of the Sierra Club and the Sustainability Council of Ventura County. On the ground support is being provided by the EV Advocates of Ventura County. Volunteers are needed to help spread the word, distribute flyers before and during the day of the event, setup and to have a good time mingling with EV drivers and educating the public. Sign up using the volunteer button at the top of this page. There are currently 189 attendees registered. Registered attendees report 1,470,932 electric miles driven.